Summary (from Amazon): An epic adventure that began with one single question: why does my foot hurt? 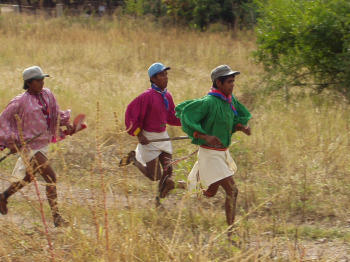 Isolated by Mexico's deadly Copper Canyons, the blissful Tarahumara Indians have honed the ability to run hundreds of miles without rest or injury. 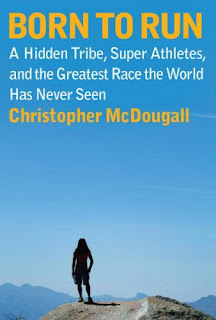 In a riveting narrative, award-winning journalist and often-injured runner Christopher McDougall sets out to discover their secrets. In the process, he takes his reader from science labs at Harvard to the sun-baked valleys and freezing peaks across North America, where ever-growing numbers of ultra-runners are pushing their bodies to the limit, and, finally, to a climactic race in the Copper Canyons that pits America's best ultra-runners against the tribe. Review: I am not a runner. I used to be an athlete, but am not anymore. I say this as a way to explain how wide-reaching and appealing this book is to so many people. I found it fascinating, interesting, funny, and poignant. I was afraid that there would be too much technical in this book, but I didn't find that at all. 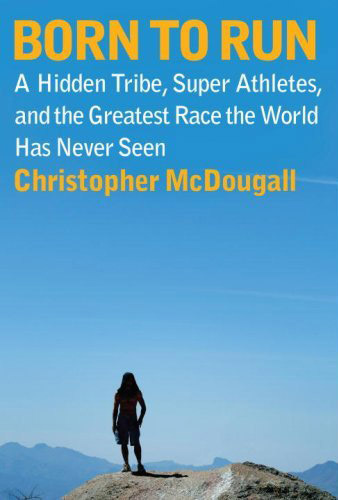 There is a great mix of running stories (which are fascinating), science (so interesting), personal stories (always a good thing), and culture (both Taramuhara Indian and ultra-runner). I feel like I learned so much and that's a good thing. The basic premiss is that ultra-runners, the Tarahumara tribe in particular, don't get hurt the way "western" runners do and the author set out to find out why that is. To boil it down to its most simplistic form: the shoes runners wear are killing them and they need to let go and enjoy the running. It turns out the higher the price of the shoes, the worse they are for you. Apparently if there is too much cushion you pound harder to find the solid, thus injuring yourself. Huh. And the happiness factor. It seems so obvious, but a number of different coaches, runners, and the author all noticed the look of sheer joy as these successful ultra-runners have on their faces, even at mile 90 in 120 degree heat is unmistakable. How does one find that? The Tarahumara have it in their daily life, but the American ultra-runners have to find it as a new outlook on life. I am jealous of the runners even though I know that I will never achieve a tenth of the stuff they do in that realm. But I highly recommend this book to anyone who wants to read about both physical and mental accomplishment as well as plain old good storytelling. Click to see my updated Google Map. I have been searching for a book to read about Mexico or Latin America, but I have trouble reading magical realism so I had given up. But, this one is non-fiction so it worked! Awesome stuff.